NCAER in collaboration with the DBT Mission, organized a one day Northeast Regional Workshop on Direct Benefit Transfer in Imphal, Manipur. Apart from NCAER and the DBT Mission, the other stakeholders that participated in the workshop included the Unique Identification Authority of India, National Payments Corporation of India, Ministry of Finance, Reserve Bank of India, Department of Posts, Ministry of Telecommunications, Common Services Centre, Bill and Melinda Gates Foundation, MicroSave, and Centre for Digital Financial Inclusion, along with senior policy planners from the seven sisters and Sikkim. This workshop is part of NCAER’s ongoing study on “Implement Digital Direct Benefit Transfers: A DBT Readiness Index for the States of India”. The main objectives of the workshop were: firstly, assess challenges in the implementation of DBT in the North-eastern region and address the respective challenges raised by various stakeholders stemming from their individual perspectives. Secondly, disseminate the concept note of NCAER on the DBT Readiness Index and the information requirements to assess the State/UT DBT Readiness Index measure. Thirdly, provide a facilitating platform to the DBT Mission and state governments in the North-eastern region (including the seven sisters and Sikkim) and other key stakeholders for DBT adoption, and address the challenges likely to arise in its implementation. Lack of adequate financial infrastructure: In this context, the Government of Manipur highlighted that it has 27 development blocks with no access to any banking facility. Although have developed an integrated infrastructure to address this issue, it is imperative to ensure mobilisation of banks to augment the existing financial infrastructure. Furthermore, many states discussed the difficulties faced by them in the implementation of the Banking/Business Correspondent Model, especially due to the delicate law and order situation in the North-east. Poor penetration of Aadhaar in some states: This challenge was highlighted by the states of Assam and Manipur. They emphasised the poor penetration of Aadhaar in some of the states. The problem stems from the decision of the Registrar-General of India (RGI) to start the National Population Register (NPR), which is a digital database of residents of the country with their biometric details. However, it is hoped that with the approval of the Supreme Court, Aadhaar penetration would start increasing in the states. UIDAI suggested that schools and hospitals should serve as Aadhaar enrolment centres to enable generation of Aadhaar cards for the local residents in the North-eastern region. The states also averred that they had access to only limited guidance for proper implementation of DBT. They listed other issues that served as roadblocks in this task such as the absence of a uniform adoption structure for IT infrastructure highlighting, the need for laying down of uniform guidelines (with particular reference to the form in which they have to be stored such as Excel formats) with regard to the different databases that the states are required to hold. The states also struggle with the transition from a family-based benefit system to an individual (Aadhaar)-based benefit system and its implementation. Nonetheless, the Central Government suggested that these hurdles can be overcome if the states use databases of the NPR and the Socio-economic Caste Census of 2011 for smoothening the transition by facilitating ‘communication’ among the databases. The key concern of connectivity was also tackled during the workshop. 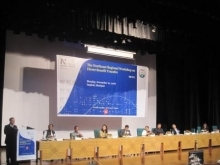 Government officials of the Northeastern states brought to the forefront that the problem of poor connectivity can be traced to the absence of a central authority to manage telecommunications in the area. The states, therefore, requested the Ministry of Telecommunications to take the lead in ensuring better connectivity through programmes such as the one being implemented in Andhra Pradesh, wherein a consolidated package comprising Internet, TV and mobile services is provided at `149 a month. It was suggested that states are not equipped to map the shadow areas in the region and would thus require help from the Central Government in this task, though some work has been done in this sphere. Finally, it was decided that all the North-eastern states would use the Public Finance Management System (PFMS) to transfer any funds and that it is crucial to impart quick training in the use of this system as it serves as the building block for DBT. In order to further facilitate the transfer of knowledge between the Central and state governments, NCAER, jointly with MicroSave and with support from BMGF, is undertaking a survey to assess the DBT Readiness of States. During the workshop, NCAER also outlined the need for such a survey, which would help assess the ability of states to adopt government-to-citizen (G2C) and government-to-bank (G2B) ICT-based solutions, entailing the electronic transfer of cash or delivery of in-kind goods and services based on biometric authentication. Citing the example of Krishna district in Andhra Pradesh, NCAER emphasised that the implementation of DBT would result in significant savings by doing away with duplication and weeding out of the ghost beneficiaries. In this way, the assessment and ranking of the states, from high achievers to average achievers, through the survey would help the states in identifying the lacunae in the implementation of DBT. It was argued that even if the government enacts good policies and puts the relevant infrastructure in place, limited usage of the facility among citizens would lead to limited success of the scheme. The proposed survey will thus engender a sense of competition among the states, encouraging them to do better in the areas where improvements are needed. MicroSave also recounted some of their experiences on the field. The workshop helped in promoting an understanding of the myriad problems faced by the North-eastern states in implementing DBT. It also offered the Central and state governments an opportunity to identify the areas in which the Central Government (and its associated bodies) needed to intervene for providing adequate support and infrastructure to the states in effective enforcement of the programme. Know more about NCAER’s ongoing study on “Implement Digital Direct Benefit Transfers: A DBT Readiness Index for the States of India”. Presentation: Rishi Raj Singh, CSC e-Governance Services India Ltd.